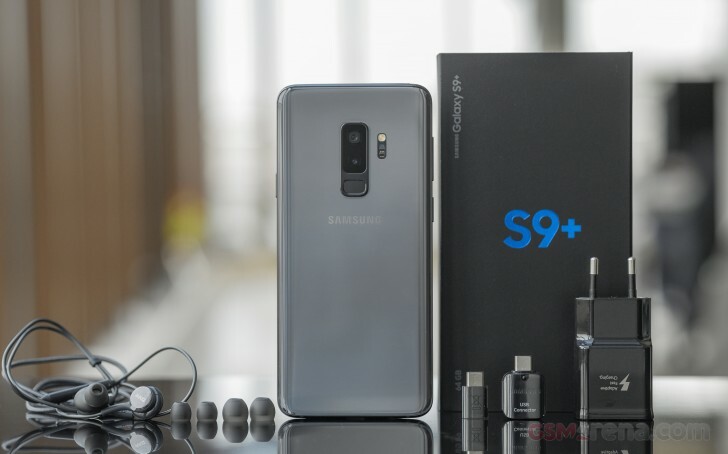 Generation 9 in plus size - this is the Samsung Galaxy S9+. Unlike last year when the S8 and the S8+ had just size setting them apart, in 2018 Samsung's Plus means more than higher battery capacity and larger display diagonal - the S9+ has an extra camera on its back too. Makes you wonder if such segmentation has been done before by other makers. Uhm, nope, nothing comes to mind. Anyway, adding the Note8's tele camera to the S9's dual-aperture wide-angle shooter makes for the first dual camera on a Galaxy S phone - you can't say Samsung's ahead of the curve on this one, but at least it's caught up now. The designers also addressed the universally hated placement of the fingerprint reader of the S8s and have moved it under the cameras, along the central axis of the phone - how hard was that to achieve in the first place? A mandatory chip update sees the S9+ packing the latest Snapdragon 845 in the US and China and the Exynos 9810 elsewhere. 6GB of RAM come standard (the S8+ could be had with 6GB in some places, some of the time, but the default was 4GB) and storage options now go all the way up to 256GB, though you'd probably be getting the 64GB version - there's a microSD slot if you need more room. A relatively big change this time around is the long overdue move to a stereo speaker setup with the earpiece now joining forces with the main bottom-firing driver. A welcome lack of changes is observed in this vicinity too - the headphone jack is here for another model year. Yay! There are, of course, AR emoji - Samsung's take on personalized animated emoji, which you shouldn't call animoji. The S9s run Oreo out of the box with the latest Experience on top, while not all S8s have been treated to that official Android 8.0 update (much to the owners' displeasure). Body: Aluminum frame, Gorilla Glass 5 front and back; IP68 certified for water and dust resistance. Midnight Black, Coral Blue, Titanium Gray, Lilac Purple color schemes. Display: 6.2" Super AMOLED 'Infinity Display', 2,960x1440px resolution, 18.5:9 (2.06:1) aspect ratio, 529ppi; HDR10 compliant (no Dolby Vision). Rear camera: Primary 12MP, Type 1/2.55" sensor, f/1.5-2.4 aperture, 26mm equiv. focal length, dual pixel PDAF, OIS; Secondary 12MP, Type 1/3.6" sensor, f/2.4 aperture, 52mm equiv. focal length, autofocus, OIS; 2x zoom. 2160p/60fps, 1080p/240fps slow motion, 720p/960fps super slow motion video recording. Chipsets: Qualcomm Snapdragon 845: octa-core CPU (4x2.7GHz Kryo 385 Gold & 4x1.7GHz Kryo 385 Silver), Adreno 630 GPU. Exynos 9810: octa-core CPU (4x3rd-gen Mongoose 2.7GHz + 4xCortex-A55 1.8GHz), Mali-G72 MP18 GPU. Memory: 6GB of RAM; 64/128/256GB of storage; microSD slot for cards up to 400GB. Battery: 3,500mAh Li-Po (sealed); Adaptive Fast Charging (same as S7/S8); QuickCharge 2.0 support; WPC (Qi)&PMA wireless charging. Connectivity: Single-SIM, Dual-SIM available in certain markets (hybrid slot); LTE-A, 4-Band/5-Band carrier aggregation, Cat.18 (1.2Gbps/150Mbps); USB Type-C (v3.1); Wi-Fi a/b/g/n/ac MU-MIMO; GPS, GLONASS, Beidou, Galileo; NFC; Bluetooth 5.0. Misc: Fingerprint/iris/face recognition; stereo speakers (bottom-firing + earpiece); 3.5mm jack; bundled AKG headphones; DeX dock compatibility. We aren't ones to shy away from the odd complaint (or a dozen) but with the S9+ it's tough to find what to complain about looking at the specs. Sure, there could have been more battery, but with this generation's weight pushing 200g, perhaps the 3,500mAh cell is for the better. The exorbitant launch price off contract is another number we're less than thrilled with, though few people will actually pay that - pre-order promos and carrier subsidies will surely knock a chunk off of it. Let's see what you'll be paying for. 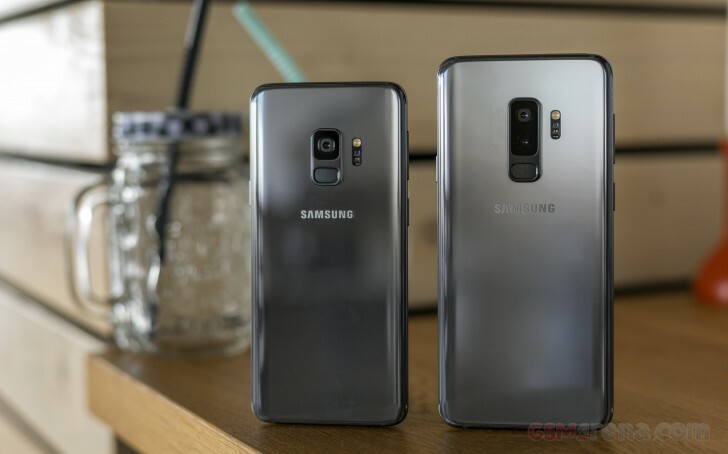 Little has changed in the presentation of the Galaxy S9+ and the S9 compared to the last generation which in turn was a slightly modified Galaxy S7 retail bundle. Instead of having the phone on top, its tray now resides below a box that contains the booklets and a SIM pin. This year, as well as last, the two different USB-C adapters, the cable, and the charger are black - to match the packaging - and potentially to look more 'tech'. The charger itself is otherwise the same old unit you could trace back to the S5, supporting Samsung's own Adaptive Fast Charging (and Qualcomm QuickCharge 2.0) and rated at 9V/1.67A and 5V/2A. An AKG branded headset with braided cables and several extra sets of tips completes the retail package. But let's turn our attention to the phone itself. Follow us on the next page where we take a closer look.